On Saturday, October 6, School-Business Partnerships of Long Island, Inc. (SBPLI), in cooperation with the Half Hollow Hills School District, will present the Seventh Annual Half Hollow Hills (HHH) Invitational at the district’s west campus located at 375 Wolf Hill Rd, Dix Hills. The event begins at 8:30 a.m. and the games will begin at approximately 9:00 a.m.
As one of many robotics programs supported by SBPLI, for promoting STEM (science, technology, engineering and mathematics) education, the HHH Invitational is designed to demonstrate the benefits of robotics programs to students, schools, communities and local businesses. During the event, students and coaches from over 18 Long Island school districts will participate in an exciting and engaging learning environment that enhances problem-solving skills, cooperation and teamwork. Participating teams will compete under the rules and guidelines of the 2018 FIRST (For Inspiration and Recognition of Science and Technology) Robotics Competition challenge, dubbed FIRST POWER UP™, and showcase their robots that performed in the SBPLI Long Island Regional earlier this year. 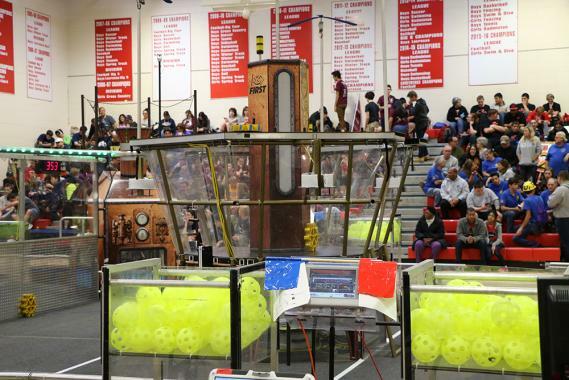 During the Invitational, two three-team alliances will bring their robots to the playing field to solve a variety of problems to score points and win rounds. Residents, teachers, administrators and business leaders from the surrounding areas are invited to attend and discover first-hand the benefits that FIRST Robotics programs provide students. This event is also the perfect opportunity for schools and organizations interested in starting a team to meet with SBPLI leaders and speak with participants to gather more information. This postseason event commemorates the end of the 2018 FRC season on Long Island. Following the Invitational, teams will start to prepare for next season, which kicks off on January 5, 2019.